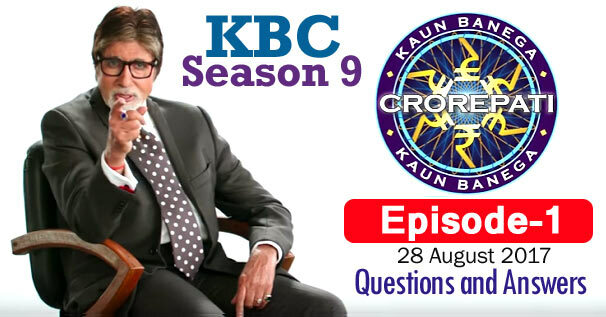 KBC Season 9 Episode 1 Questions and Answers: The first episode of Season 9 of Kaun Banega Crorepati (KBC) was telecast on 28th August 2017. In which Amitabh Bachchan had asked contestants 22 questions of General Knowledge. The correct answer to all the questions is given below each question. By reading these questions, you can prepare yourself for the next KBC Season 10 of Kaun Banega Crorepati. Because by reading these questions, you will understand what kind of questions asks Amitabh Bachchan in KBC. These all general knowledge questions will be helpful to for you various Competitive Examinations and Interviews besides KBC. Remember, the answer to some question may be in accordance with that time, while the answer to those question may differ according to the present time. 1. With reference to a wedding, What does "Laal Joda" means ? 2. What is the point of playing this song ? 3. The name of which of these Shakpearan character features in anti eve-teasing squad formed in the state of Uttar Pradesh ? 4. What is the common name for surgery conducted on coronary arteries that supply blood to the heart ? 5. How many players of Kho-Kho team can play on the field during the match ? 6. Which of these Indian cities is closest to the Pakistani city of Lahore ? 7. Which of these Government schemes deals with the expansion of LPG connection to households below the poverty line ? 8. In July 2017, Narendra Modi Become the first Prime Minister to visit which country ? 9. Which of these gods is also known as Ramapati, Ramakant and Ramaraman ? 10. Starting from the northernmost, arrange these mountain and hill ranges from north to south. 11. If you call someone 'Makkhichoose' then what are you calling him ? 12. What number is used with reference to a type of cricket match as well as normal vision ? 13. What is the term used for shops that provides the buyer exemption from certain taxes ? 14. What is 'bapu' in this song ? 15. Which of these musical instrument is held in one hand and played with the other ? 16. The Chief Ministers of which two Indian states have the same first name ? 17. Which Chetan Bhagat book has the following dedication,"For my Mother / For rural India / For the non-english types " ? 18. More than 90 percent of the giant panda's diet consists of which plant ? 19. In ODI Cricket, who created the record of scoring the fastest century in just 31 balls ? 20. Which Indian state announced a second capital in 2017 ? 21. At which of these institutes did Dr APJ Abdul Kalam deliver his final lecture ? 22. On the last day of his life Bhagat Singh was reading a book about the Ideology of which revolutionary ?